New London, CT Members of the Mitchell College and New London community gathered to break ground on the Red Barn reconstruction project. The project recreates the 4,800 s/f structure on Montauk Ave. into a large flexible space that can be transformed for student and community uses. “The Red Barn will become a hub of activity for our campus, a creative space for our Performing Arts program, a gathering place for our students and a resource for the community,” said President Janet Steinmayer as she opened the groundbreaking ceremony. She thanked the more than 300 donors and attendees of last spring’s gala Red Barn Raising for funding the $1 million project. Board of Trustees chair Kevin Hennessy called this “a pivotal moment in Mitchell College’s future. We are embarking on the completion of the first phase of the Campus Master Plan.” The next phase will enhance the athletic fields and facilities. The goal of the project has been to give new life to the iconic Red Barn which holds such a prominent place on the Mitchell College campus. The structure will be reconstructed in its original form and character using new materials. Within the design, any elements of the original barn that can be reclaimed will be incorporated into the design. The interior space will maintain the look of a traditional post and beam structure with the addition of a trussed roof system which allows for an open floor plan conducive to its use as a black box theater and event space. 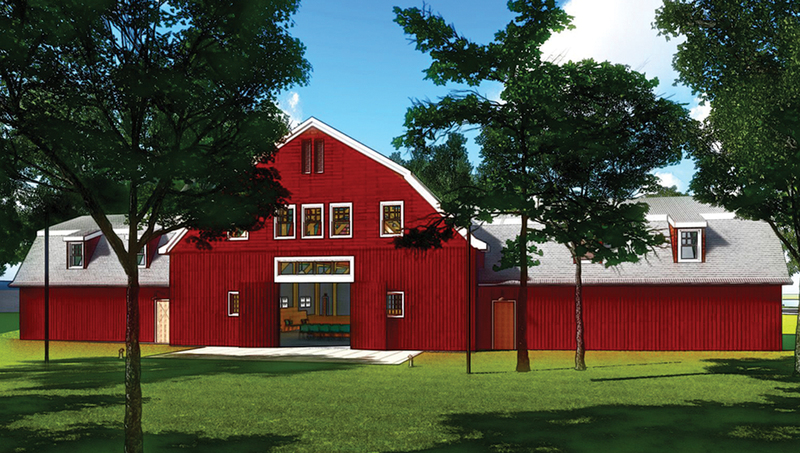 The barn interior will include a catering staging area, restrooms, and spaces that can be partitioned for many uses. Centerbook, known locally for the rebuilding of the Ocean House and work at Yale, UConn and Quinnipiac University, led Mitchell College through the development of a campus master plan in 2015. The plan, which was designed to be implementable as discrete projects in a flexible order, identifies five primary areas: Reconstructing the Red Barn into flexible space for student and community use, reconfiguring and enhancement of athletic fields and renovation of facilities, building a Science and Sailing Center on the Thames River, establishing the Umbrella House as a central icon building and creating a campus oval surrounded by small classroom buildings in the style of New England shingled cottages. Kent + Frost Landscape Architecture, designers and construction administrators on the Mitchell Woods rejuvenation project which has completed its first phase, are working with Centerbrook on the campus master plan. Builders anticipate a spring completion date.